Sept. 9, 2014, Oro-Medonte, Ont. – The County of Simcoe is officially the newest co-owner of the Lake Simcoe Regional Airport Inc. (LSRA). The agreement was recognized with an official signing event at the airport with County of Simcoe Warden Cal Patterson, City of Barrie Mayor Jeff Lehman and Township of Oro-Medonte Mayor Harry Hughes. Sept. 9, 2014, Oro-Medonte, Ont. 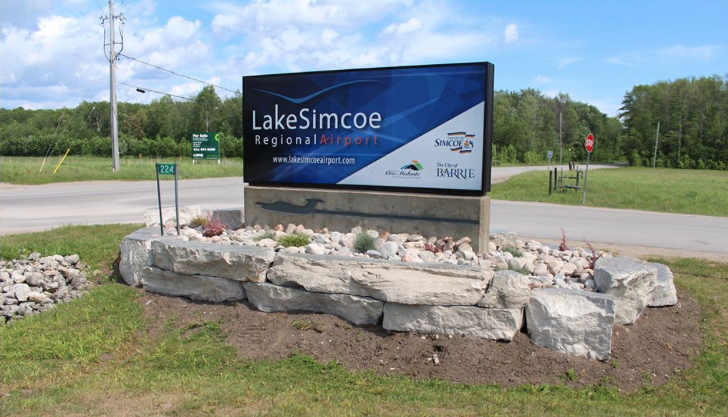 – The County of Simcoe is officially the newest co-owner of the Lake Simcoe Regional Airport Inc. (LSRA). The agreement was recognized with an official signing event at the airport with County of Simcoe Warden Cal Patterson, City of Barrie Mayor Jeff Lehman and Township of Oro-Medonte Mayor Harry Hughes. The agreement now makes the County of Simcoe a 20% equity owner, the City of Barrie a 60% equity owner and the Township of Oro-Medonte’s equity share remains unchanged at 20%. Throughout 2013, the County engaged in discussions with the City of Barrie and Township of Oro-Medonte regarding co-ownership of the LSRA. The County of Simcoe, including the urban areas of Barrie and Orillia, provides a catchment population of approximately 450,000. The majority of this population is within a 40 minute drive to the LSRA. The LSRA is one of the newest and most sophisticated regional airports in Canada. Located less than 20 minutes from Barrie, it boasts a 6001’ long lighted runway capable of handling a broad range of aircraft including helicopters and commercial jet aircraft.